Dilemma on the Merc’s front page: Lead with Netscape? Jerry Garcia death? As a postscript to the recent coverage revisiting Netscape’s eye-popping IPO of August 1995, it’s worth recalling how the leading newspaper of Silicon Valley carried the news — and what it emphasized instead. Dilemma seemed to lurk on the front page of the San Jose Mercury News on August 10, 1995, the day after Netscape Communications, a Silicon Valley startup then just 16 months old, shocked financial markets with an enormously successful initial public offering of shares. Netscape, maker of the very popular Web browser called Navigator, offered some 5 million shares at $28 per share — and opened after nearly a two-hour delay at $71. Share prices climbed as high as $74.75 before settling at the close of trading at $58.25. It was a stunning launch that had the corollary effect of illuminating the early Web for millions of people. Before dawn on the day of Netscape’s IPO, counterculture hero Jerry Garcia died of a heart attack at a drug and alcohol treatment center near San Francisco. Garcia, who had turned 53 eight days earlier, was founder and front man of the immensely popular Grateful Dead. The band’s final show with Garcia had been just a month before, at Solider Field in Chicago. So which story would lead the Mercury News in its edition of August 10, 1995? 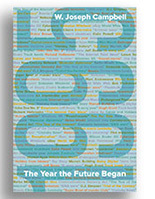 Netscape’s IPO, which signaled the entry of the World Wide Web into mainstream consciousness? The death of Garcia which, despite his declining health, had shocked and surprised so many people? 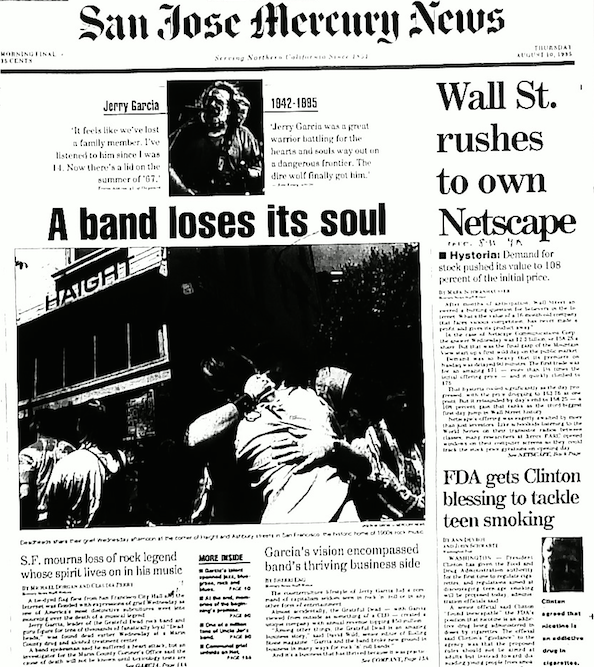 Twenty years ago yesterday, stories about Garcia and Netscape were crammed into the upper reaches of the Mercury News front page. Somewhat surprisingly, perhaps, Garcia’s death received more expansive treatment. The Mercury News published two front-page articles about Garcia, one nearly 1,100 words and the other more than 900 words. They were accompanied by two prominent photographs, one of Garcia and the other of fans in mourning. The longer article noted the many reactions posted online about the musician’s passing and declared that “one of America’s most distinctive subcultures” was in mourning “over the death of a musical legend. “Jerry Garcia, leader of the Grateful Dead rock band and guru figure for tens of thousands of fanatically loyal ‘Deadheads,’ was found dead earlier Wednesday …. “The 53-year-old singer, guitar player and composer was frequently ill in recent years from diabetes and the effects of drug and alcohol abuse. But he and his band continued to fill auditoriums, making the Grateful Dead one of the most long-lived and financially successful rock bands. “After months of anticipation, Wall Street answered a burning question for believers in the Internet: What’s the value of a 16-month-old company that faces vicious competition, has never made a profit and gives its product away? “The first trade was for an amazing $71 — more than 1 1/2 times the initial offering price — and it quickly climbed to $75. “When the stock hit the market on Wednesday, frenzied investors drove the price to $75. It’s now settled down at about $50 — meaning that the company is valued at around $2 billion, or over 100 times projected earnings two years from now. It wasn’t quite as stark as all that. And Netscape’s IPO proved more consequential than was recognized at the time. “Before then, companies needed a stronger track record to experience a successful IPO. Venture capitalists took chances. Wall Street didn’t. Quite so. A lot changed with Netscape. This entry was posted on August 11, 2015 by W. Joseph Campbell in 1990s, Anniversaries, Early Web, Internet, Netscape, Watershed year, World Wide Web and tagged 1995, Early Web, Hinge moment, Mercury News, Netscape, Recent past, Silicon Valley, Startup, Watershed year.